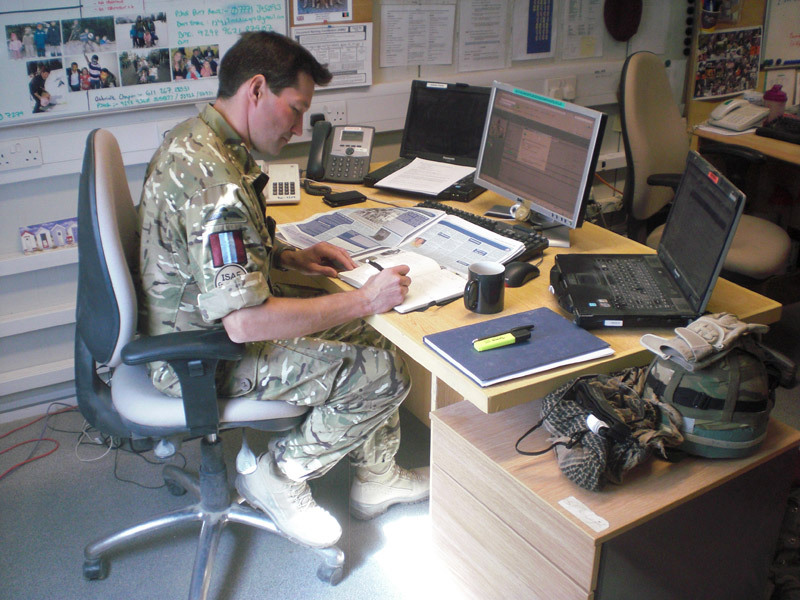 Lieutenant Colonel David Eastman blogs about a typical day in the life of the spokesman for Task Force Helmand. This week I thought I would give you an insight into a typical day for me here in Task Force Helmand Headquarters, when I am not gallivanting around the country impersonating a journalist. Most days start at 0600hrs (there are no weekends here! ), with my deep sleep rudely interrupted by the rather loud iTouch that serves as my constant companion (it’s that or you get woken by the world’s most expensive alarm clock as a Merlin or Chinook helicopter comes in to land!) I then spend 30 minutes running, rowing or cycling to get the blood flowing; this is the best time of day for exercise because it doesn’t feel as though you are running under a sun-lamp. After a quick breakfast I hurry over to the headquarters to prepare for the morning brief. Every morning Commander Task Force Helmand, Brigadier James Chiswell MC, gathers together his staff heads and we go through the previous evening’s activities – Taliban attacks, Battle Group operations etc, as well as discussing the coming 24 hours. My part is to keep the team updated on what is happening in the UK and International media, as well as what the local Afghan media is reporting. I also make sure that I keep everyone apprised of important sports scores, or bizarre stories from The Sun just to keep the team’s morale up. We are 4½ hours ahead of the UK, so by lunchtime the phone calls and emails from the UK start arriving. Usually it is journalists requesting information, or our superior headquarters in the UK, the Permanent Joint Headquarters (PJHQ) in Northwood, or the Ministry of Defence with whom we are in daily (often hourly) contact. We have lunch at 1300hrs – the food here is particularly good, hence having to exercise so much, and then after lunch, if we are not out hosting an embedded journalist, covering an operation, or planning the next operation, we will deal with the various email requests from the UK, and then take turns to do some more exercise for half an hour. In the late afternoon I start preparing for the evening update, which is a formal brief to the Commander and staff about the events that have occurred during the day. It is a bit of a powerpoint frenzy – a bad habit that we seem to have picked up from the US Army – but it allows me to show some of the articles that have been published about the Task Force in the UK press that day. After dinner, I return to the office to clear more copy, prepare the daily update which is distributed to all our superior HQs in Afghanistan and the UK, and get ready for the following day. I leave the office at 2300hrs most days, and, after half an hour reading my new toy – a Kindle – or writing home, am back in a deep slumber by midnight… only 6 hours until the dreaded alarm interrupts my dreams of home again! This entry was posted in TFH HQ and tagged Afghanistan, Army, British, Media. Bookmark the permalink. Good to see you busy sir, with the newspaper and all home comforts such as iTouch. A really interesting insight into the working day at Lash Vegas, thankyou. I’m a former Gunner Officer now studying to become a journalist. It’s very interesting now that I’m seeing everything from the otherside of the fence. Colonel, I look forward to your next post. Hi David, Ur so privilidged in that ur a Soldier at a time of technological gadgets, unlike WW1/2 who had None. LUV 4U ALL.